This week’s Bake! recipe was chosen by Andrea. 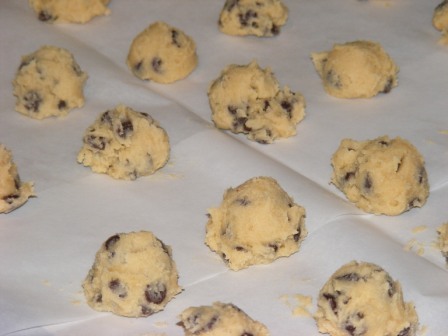 Leave it to a German to pick that most American of recipes, chocolate chip cookies! According to legend these cookies were invented by dietician Ruth Wakefield who, along with her husband, owned and operated a Massachusetts inn known as the Toll House. 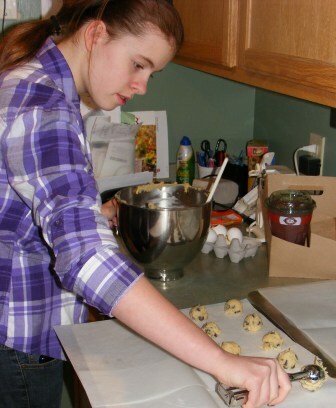 Ruth tried to convert her brown sugar cookie recipe into chocolate cookies by adding chocolate chunks to the batter. She thought the chunks would melt into the dough, resulting in a chocolate cookie. And the rest is history. 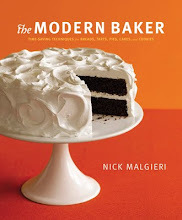 The recipe in Nick’s book is derived from Ruth Wakefield’s original recipe. The only differences are that the baking soda isn’t dissolved in water, which is unneccessary, and Nick’s recipe uses chocolate chips rather than chocolate chunks. This is also the same as the back of the bag Toll House cookie recipe, with two exceptions: the original recipe called for two cups of nuts rather than one; and the cookies are baked for 12- 14 minutes, a bit longer than today’s recipe. This results in slightly crisper cookies but ones that taste just like what you’re used to. 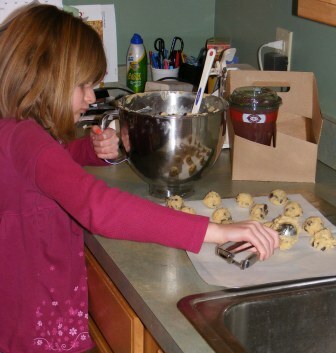 I baked this recipe with the girls, who are always up for cookies. Here they are scooping out dough. And here are the cookies ready for the oven. I didn’t end up getting a picture of the finished product. But they look like any other chocolate chip cookie you’ve seen, just a bit on the crispy side. These were really good, and I would reach for this recipe if I needed a quick reminder of the Toll House recipe. I left out the nuts, as the kids don’t like them in cookies. And I would remember to bake them for less time so they stay soft. I love the ice cream scoop idea, but then you don’t get that extra dough stuck to your finger that you just have to eat!! A classic!! Don’t worry — the girls find plenty of excuses for tasting the dough, scoop or no scoop. You know WHY I, the German, picked this recipe? Because chocolate chip cookies were the very first traditional American thing I ate like 20 years ago!!! So jealous at this spoon thingy – makes beautiful cookies! Is that an ice spoon? It’s basically a small scoop, like an ice cream scoop. It’s made for shaping cookies. Great cookie helpers you have over there…I need some girls, definitely. They do it perfectly…nice round shapes all the same all in a row ready for the oven, just exactly the right way to do it. Matt be eating the dough, would do a few nicely and then he would think, “I bet this will take less time if I make them bigger and I like big cookies so I’m just going to wing this….” and that would go on for another few and then there would be this: “I know, I will make ONE GIANT COOKIE and be done with all this messing around and I will have ONE GIANT COOKIE to eat when I am done!” Sometimes it is best just to work alone or at least with fewer expectations with teenage boys…lol. The girls are adorable. It’s nice that they are old enough now that their help is helpful. I spent years rescuing recipes and cleaning up from their “help”. Now it’s both enjoyable and beneficial to have them in the kitchen with me. LOL about Matt. I can see just how that would go. That’s why he needs a girl who can bake for him — just like Mom. Need to get to these soon. Love the pictures of your helpers!! They are really good. I would cut back on the time a bit if you like softer cookies. YUM!!!! Chocolate Chip Cookies. Cute helpers you have. Thanks. It’s fun baking with them.